A month before our wedding, I was hit with a huge craving for KFC (Korean Fried Chicken). Fried chicken wasn’t really part of “wedding diet”, but my appetite is stronger than my self control. It helps (or not) that The Hubby also can’t resist fried goodness. So we drove up to Home of Hot Taste for a weekend dinner. Atmosphere: Walking up to the restaurant, The Hubby was worried. “Are you sure this place does KFC? There’s lots of ads for other Korean dishes”. I assured him we were at the right place. The restaurant was casual and had lots of high, private booths, perfect alcoves for binging on chicken and beer. While we ate, quite a few customers came by to pick up take-out orders. I could see the space filled with families for dinner and shifting to a younger crowd, later at night. Service: One downside of high booth walls was how hidden we were. If the server wasn’t paying 100% attention, it was sometimes hard to get his attention. Other than this, we were seated quickly, food arrived hot and service was standard. A few weeks later two of our friends stopped by. They tried to order the spicy chicken with the sauce on the side, they meant to order the regular chicken with the sauce on the side. 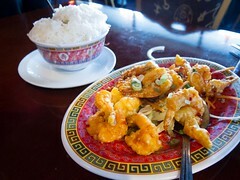 Rather than correcting them or giving them options, the server said the spicy chicken was as is. This may have been a language issue but it would’ve been nice for the server to be flexible, offer ideas, or different menu options if their order didn’t make sense. 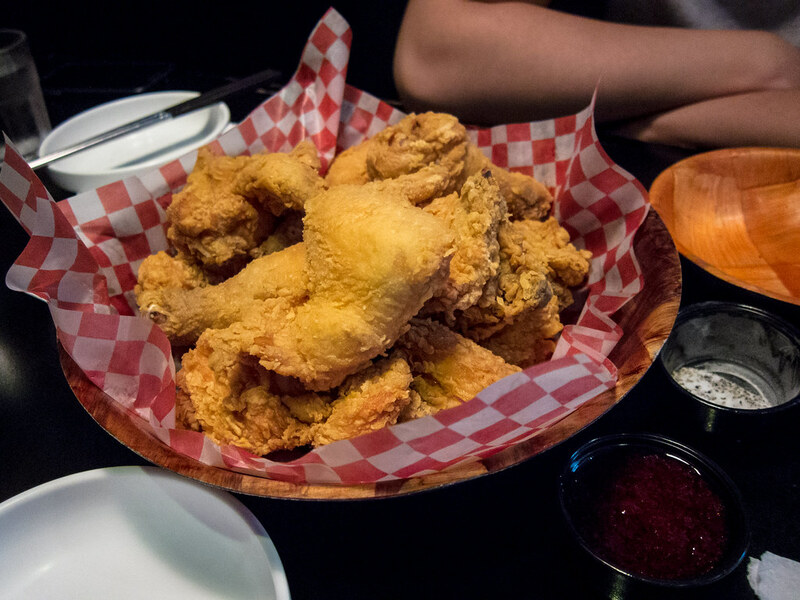 Food: For the two of us, we ordered a whole order of Original Fried Chicken with a side of Spicy, Sweet Sauce. I really wanted to try one of their Blazing Fire plates but the price and portion size would’ve been too much food for two people, especially as The Hubby didn’t want anything spicy. The side dishes also looked like full plates, so we just stuck with chicken. 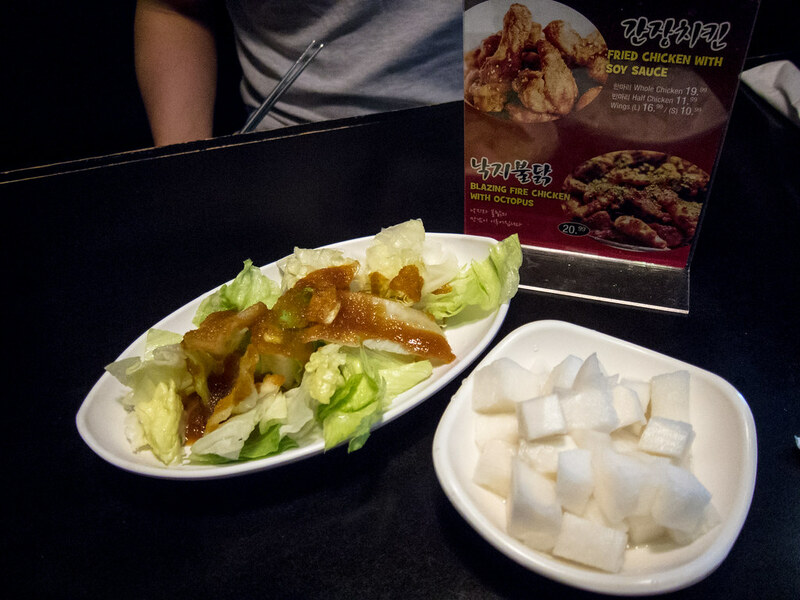 Only two side dishes were served, an iceberg salad and pickled radish. On the menu it listed the cost of ordering additional side dishes ($0.50 for radish). This was a little disappointing, but again not the reason we were at the restaurant. 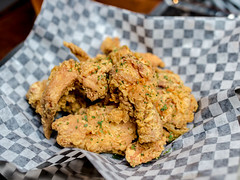 Our platter of fried chicken arrived with a cup of seasoning (salt, pepper, etc) and spicy sauce. That sauce, holy cow that was spicy. I was glad we ordered the original flavour and I could control the heat myself. Even then, a few drops was fire and my lips were burning. 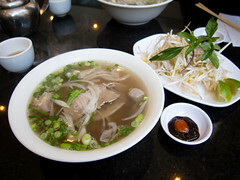 Drenched in the sauce, each bite would have been a challenge to eat. The chicken itself was juicy, tender and thoroughly cooked. I loved the pieces of dark meat. The batter was light, crispy and not at all oily. I wish the breast pieces were chopped smaller so there would be more delicious batter. Based on chicken alone, Home of Hot Taste and The Fry are pretty close to par. 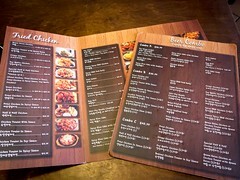 However, Home of Hot Taste does deliver more taste bud scorching and a larger variety of menu items.